Occasionally we are sought for comment on this and that in the press or someone writes something nice about us (so far it is all nice). Here’s a sampling of some of the press we’ve appeared in. 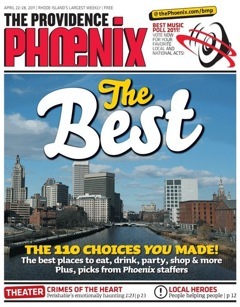 The Providence Phoenix Readers poll crowned us the Best Local Blog of 2011. The process of living in urban environments is a commitment that can always use a little help, and in the last couple of year the cultural and political posts on this LaProv-centric realm have proven to reveal part of the city’s soul. From updates on the Route 195 relocation to shared photos of the ever-changing neighborhoods, it’s an essential stop for those who dwell in our capitol. Hey, they even have the full text of Linc’s budget address. Call it a great digital cornerstone, and don’t forget to “like” the Zoo’s giraffe cam before you leave. Ted Nesi asked our Jef Nickerson to write a guest post on his blog at WPRI. Yes, a streetcar line will cost us money. But when examining those cities building or planning streetcar systems, Providence is among the best suited structurally in the country to make such a line successful. Our streetcar line will tick the boxes of serving existing employment areas, spurring economic development on under- or un-utilized land, and expanding transit ridership in the state and region. The investment is worth it, and the city and state should do all they can to support and promote it. Ted reviews the persons named to Mayor-Elect Angel Taveras’ Transition Committees, including Greater City Providence’s Jef Nickerson. The committee will spend the next several weeks meeting and working with the transition’s three co-chairs: Jay Palcencia, Mark Ryan and Myrth York. Each has been tasked with analyzing what’s going on in its subject area; figuring out how to put Taveras’ campaign promises into action; suggesting what the city’s policies should be going forward; offering short-term recommendations, “especially those that would have an impact on the current city budget” (presumably by reducing it! ); and establishing long-term goals. Taveras will receive a full report encompassing all seven committees’ recommendations by Dec. 21. Taveras will be inaugurated two weeks later, on Jan 3. Members: Marilyn Cepeda, Robert Corrente, Doris De Los Santos, Larry Eichler, Joe Fernandez, Yvette Jaquez, Carlos Lopes-Estrada, John Marion, Jef Nickerson, and John Speck. Story about the proposed demolition of the facade at 35 Weybosset Street. Story about old-media, new-media, and where the twain shall meet. Nickerson… thinks Providence, with its small size and creative population, is the perfect place for experimentation with new media models – including local online-only news outlets that pay reporters. “There needs to be a technological way to make that happen, and a design way and a creative way,” he said. Story about the proposed Hotel Sierra on Washington Street. The lot was cleared and progess seemingly stalled. Since the story was written, the lot has been turned into a “temporary parking lot”. With the Washington and Fountain Street buildings just the latest structures to come down without quick replacement, many are now questioning whether the city’s regulations are strong enough to preserve the city’s urban fabric. Providence can’t keep allowing developers to knock down buildings without assurance that the projects will go forward, or at least some sort of financial penalty if it does not, said Jeff Nickerson, of the urban-growth group Greater City Providence. “We are for some reason continuing to knock holes in that remaining urban grid. The Hotel Sierra site, the old circular gas station at Atwells and Broadway, the old Public Safety Complex, the One-Ten Westminster site, Grant’s Lot … What is next? The Arcade?” Nickerson said. “I suspect that in many ways the city is encouraging unadulterated demolition. Developers can bring financially shaky proposals to the table, knowing full well that if their financing falls through, they’ll be allowed to park cars on the vacant lot. The Procaccianti Group has even gone so far as to cry financial hardship about the minimum landscape requirements for a surface lot. The city needs to start defending itself against these sorts of predatory developers,” he said. And he shuddered at the idea that the property might become another temporary parking lot, saying the city should immediately write that option out of the zoning ordinance. Story about street abandonment for the Vista Della Torre proposal on Federal Hill. Jef Nickerson, president of Greater City: Providence, a group that promotes dense, walkable and affordable development in Providence, questioned whether the city should abandon Bradford Street when the project has so many steps ahead. “I don’t really think it has much chance of happening, and the City Council is moving a little fast on a project that may not happen,” he said. Nickerson and others have questioned whether the street abandonment is allowed under the city’s existing Comprehensive Plan, and whether the City Council’s ordinance committee acted correctly when it gave an early approval to the abandonment last month without waiting for a recommendation from the City Plan Commission. Vista Della Torre is an $80 million, 33-story project at the intersection of Bradford and Federal streets proposed by Frank and Michael Zammiello, a local father-and-son development team. “The process by which the street is being taken does not seem to be above board and by city policy,” said Jef Nickerson, of the smart growth advocacy group Greater City Providence. On June 19, in what Nickerson and others called a highly unusual occurrence, the City Council Public Works Committee voted in favor of the abandonment of Bradford Street following a public hearing, on the same night that the developers voluntarily withdrew their application for the street abandonment at a hearing of the City Plan Commission. Downcity Providence is poised to take off as the next urban revitalization success story. It’s been on the precipice for years, receiving steady infusions of hope here and there, but this time advocates say it’s really happening. Jef Nickerson disagrees. He moved here in 2003 after living in New York City and became the facilitator for Urban Planet Providence, an online discussion forum about local urban issues, and president of Greater City: Providence, a citizen group that advocates development that will make the city vibrant with robust mass transit and economic opportunity. “At one of our forum meetings,” he says, “ we had a show of hands from people who had been in Rhode Island less than five years, and the overwhelming majority of us fell into that category.” Nickerson is positively giddy about Providence’s potential. “Providence was the best, most affordable, most livable urban place to live in New England,” says the native New Englander. But what if quality of life got any worse than it is to- day? “I’d move to Boston in a heartbeat,” he says. Bret appeared on the Mayor’s chat show, “The City” with Scott Wolf and Garry Bliss. Profile of the launch of Greater City Providence. A new advocacy organization was launched last week that aims to promote cutting-edge urban planning and development practices in Providence and surrounding communities. Greater City Providence will focus on transit, architecture, open space, zoning, and residential and commercial development issues in the capital city, said Jef Nickerson, the group’s president. City newsletter interview about the Providence Tomorrow charrettes. In the invitation to residents, the organizers of the charrettes asked the following questions: What makes Providence a great city? How should we plan for future growth? What principles should guide us as the city changes? What is your take on the questions that were posed? Jef: Providence is a great city because it’s a city. There are many suburbs that masquerade as a city but Providence is a real city. Providence has all the ingredients that make a great city – the diversity of people, the diversity of architecture, the diversity of cultural opportunities, restaurants, and nightlife. Everything I need is within two miles from my home and that I can get there on foot. Bret: I think the hyper urban, hyper density of Providence is what makes it great. It has the amenities of a big city within a small compact space. I think we should plan for future growth within an urban footprint. I believe they should plan it to the model of better walkability, mass transit, and economic opportunity.